Howdy folks. Long time no see. Did you miss me? I totally missed you. With all the packing, moving, unpacking and trying to figure out how to maintain the fragile balance of harmony in our new home (aka trying to return my kids to their normally scheduled programming of minimal meltdowns), l totally fell off the blogging wagon this past month. Oh and also, I haven’t been able to stick to a menu plan for the life of me during all of this and have blown my grocery budget every week. AAAAAH THE CHAOS!!! (insert maniacal laughter, hair pulling and running in circles here) It’s been craziness, I tell you. I blame it on the cereal. Now I’m ready to iron out the wrinkles and get back into a groove of quasi-normalcy, starting with my return to the ever-reliable menu plan. Baby steps. This entry was posted in Menu Plans and tagged baking, breakfast, cooking, dinner, DIY, food, frugal, frugality, home, homemade, kid friendly, kitchen, life, lunch, meal plan, meals, meatless, menu, menu plan, moving, recipes, saving, snacks, vegetarian. Bookmark the permalink. 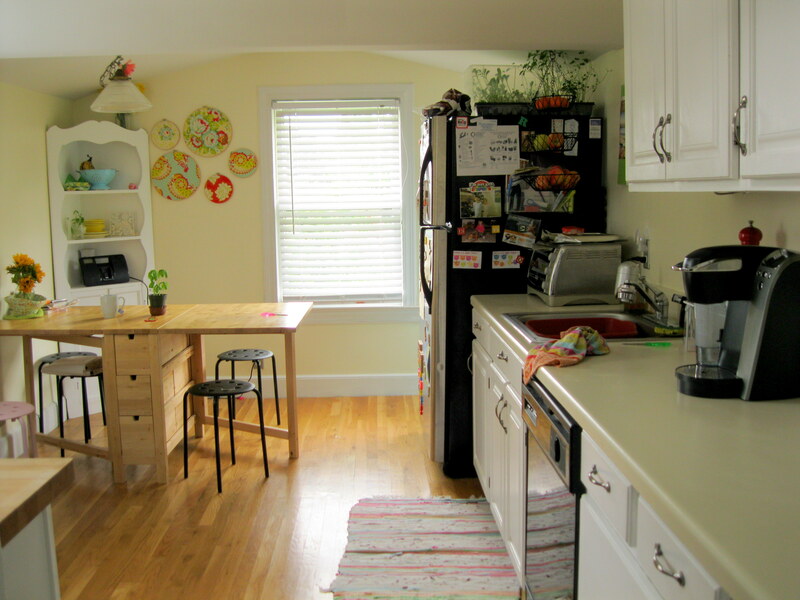 Your kitchen is adorable! Congrats to getting lots of counterspace, too! 🙂 Your menu looks great–now I want mango and sweet potatoes 🙂 Have a lovely week! What a lovely kitchen! Glad to hear from ya!